Can you even with that Laura Mercier brush??? I KNOW. Fall is always such a fun time for beauty. So many great launches, all the holiday sets just around the corner - it's like a smorgasbord of new makeup and skincare! I have to admit I am not always lusting after what's new, because there is still so many great products out there that I have yet to try, but this week's finds happen to all be relatively new launches. There are so many amazing foundations that have been released recently, it's hard not to want them all! This new one from Laura Mercier has been my absolute favorite, though I did not yet try this one, which everyone has been raving about. 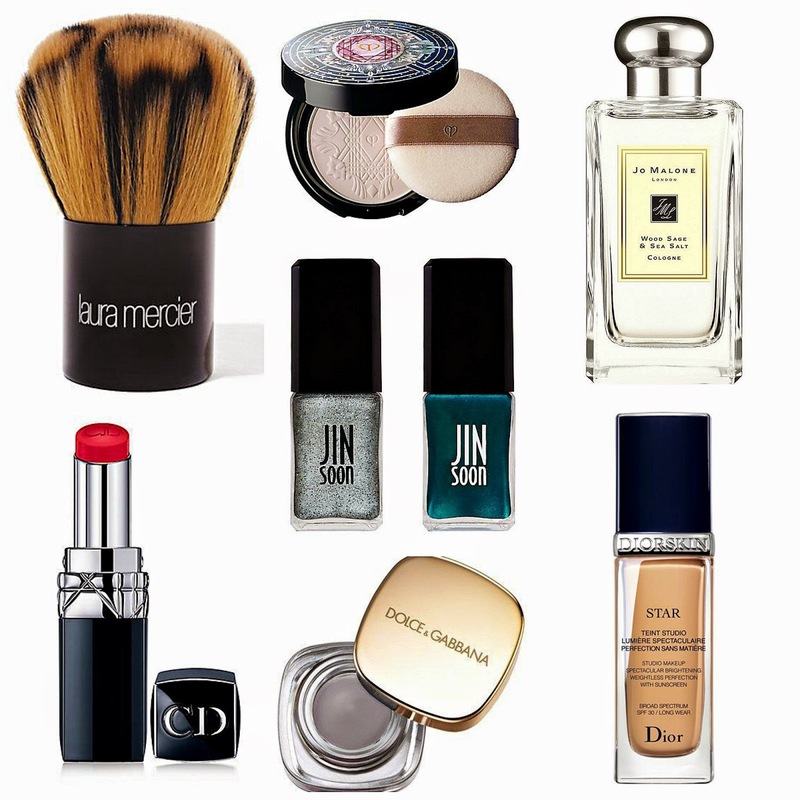 What's on your beauty wish list this week? 1. Laura Mercier - the pattern of this brush is everything. 2. Dior Rouge Baume - I have a weakness for lip products and the fact that these are sheer makes me want them even more. I popped by the Saks counter the other night to check them out in person, but sadly there were no testers. I may just have to buy some sight unseen. 3. Cle de Peau Beaute Translucent Powder - I am such a sucker for packaging. 4. JINsoon in Melange and Heirloom - I love JINsoon polishes and her colors are always so unique. This season's collaboration with Tess Giberson is no exception. 5. Dolce & Gabbana Perfect Mono Matte Cream Eye Color - After falling in love with their eyeshadow quad in Desert, I am eagerly wanting to try more eye products from D&G. 6. Jo Malone Wood Sage & Sea Salt - So different from any other Jo Malone scent I've experienced - this woodsy/citrus-y fragrance is next on my list. 7. Dior Star Foundation - Even though I complain that their Forever Flawless Perfection Wear Makeup has a horrible shade selection, I STILL want to try this new foundation. I'm keeping hope alive that this will match a tad better. How can there not have been a tester? That doesn't compute. And that Jo Malone fragrance line looks terribly tempting!